It is going to be absolutely horrid weather tonight for the kiddos. In the 40’s, windy, and rainy. Hopefully, the forecast is exaggerating, joking, or confused, lol. Either way, I bet they will still have a blast. 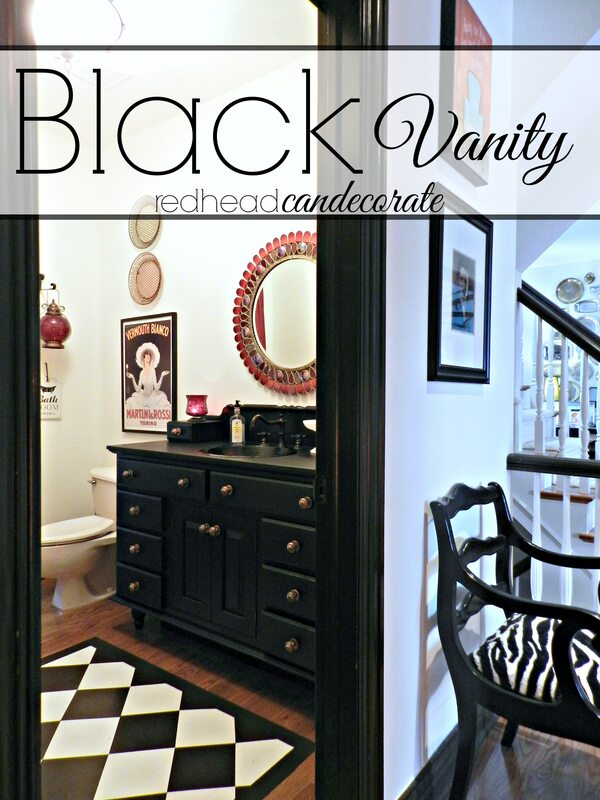 This “Black Vanity Makeover” wasn’t something I planned on doing. I was cleaning the bathroom last week, and realized the top of the vanity had really worn. So, I wrote in my datebook on last weekend, “paint vanity”. I probably would have let it go longer, but we plan on selling in a year or 2, so this stuff needs to be done. Bathrooms are a huge selling point. I took a shot of the bathroom from outside in the hall for you so you can see how the decor ties in. This hall runs directly off our laundry room from the garage, and the kitchen is in front of that chair. How I did the “Reupholstered Chair w/ a Ripped Blanket”. How I painted the “rug” on the wood floor. “Thrift Store Silver Platter Wall” in background foyer. Isn’t the vanity gorgeous black? She shines like the movie star she was meant to be. 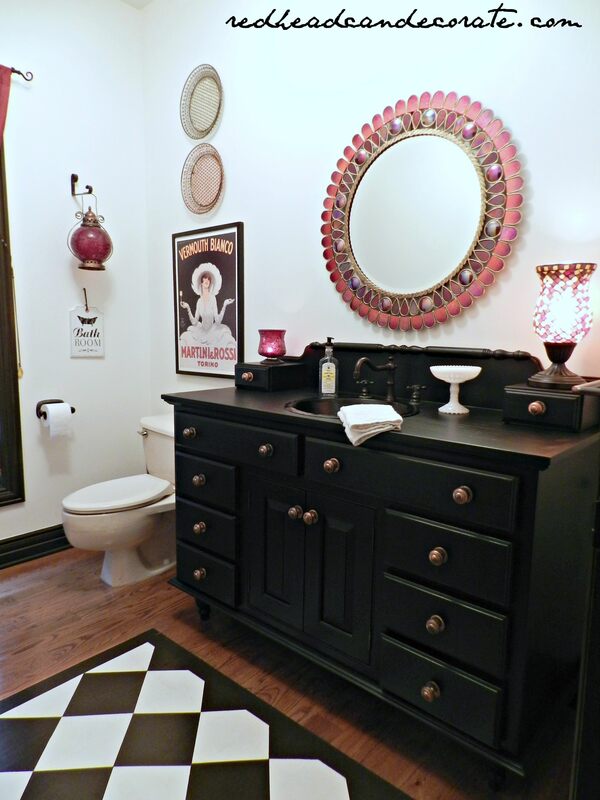 When we moved in, the vanity in this 1/2 bathroom was beautiful. I should have left her alone. After years of denial, I can finally admit I ruined it. I tried being cool and distressed it thinking it would look better. Then there’s the sink drama. 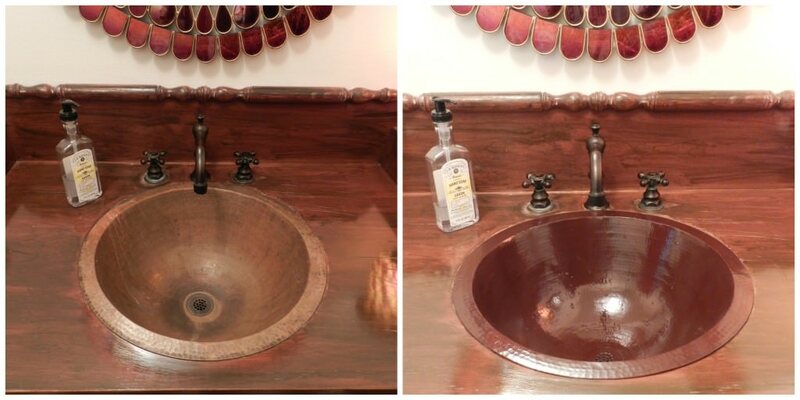 we went out and bought a copper sink to try to make it look better (it was originally creamy ceramic). It was nice for a while until I cleaned it with something I will never admit. A few months ago we spray painted it with brown spray paint. It helped, but I still wasn’t happy with the overall look. 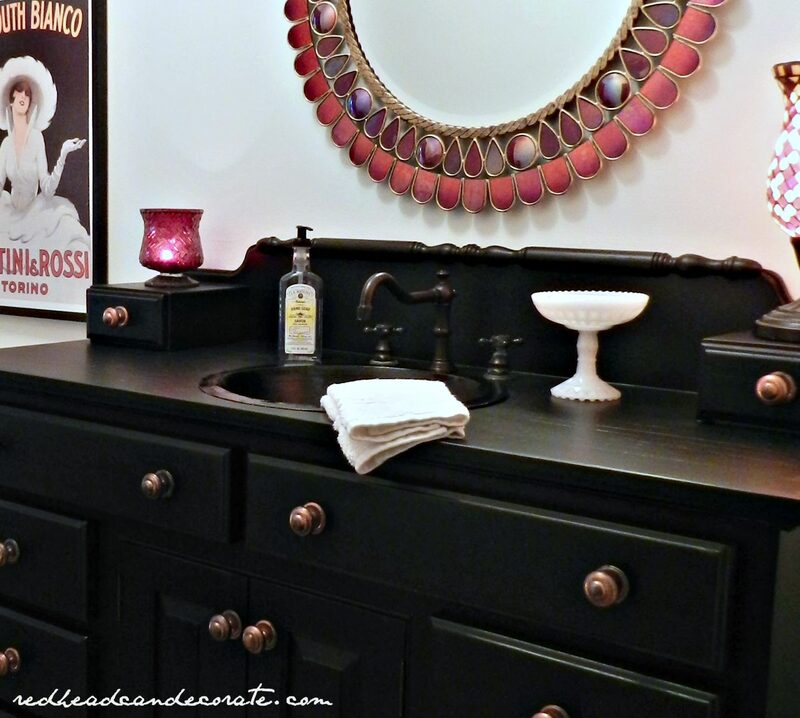 After painting the vanity black, I spray painted the sink black as well. Ahhhh… satisfied and in love with the fresh look. Even my thrift store milk glass soap dish is happy. All I had to do was sand the vanity in all of the rough areas after removing the hardware. Then, I painted like a mad woman using my favorite paint, Behr Premium Plus Ultra. The color is “Black”, and the sheen is eggshell. Behr Premium Plus has the primer in it. This only needed 2 coats. Eggshell sheen is flat looking, but it still is easy to wipe. Love it Julie! I missed the part where you talk about moving???? I was thinking the same thing, my friend! Third time is a charm. 😉 It looks awesome Julie, I love how it turned out!! You are very talented. Thank you for sharing your ideas. This is helping me for my first home purchase. 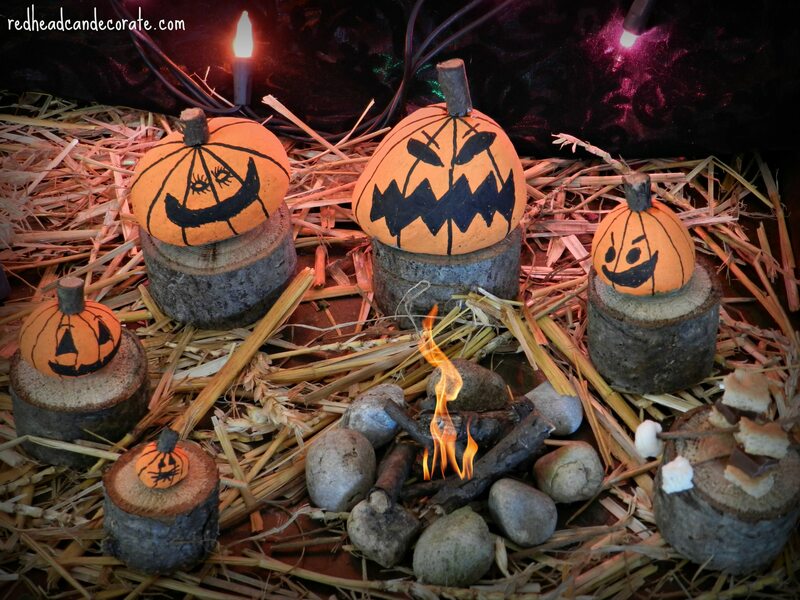 I really like all the great DIY projects. It looks great. I’m so nervous about painting cabinets. A big improvement!! I love black cabinets. The painted rug looks great! Thanks for the name of the paint. Can’t wait to try it! Ok so I bought the paint and I’m gearing up to painting my laundry room cabinets black, inspired by your kitchen makeover I thought I’d start small. Curious what your laundry room looks like? Love all your ideas! 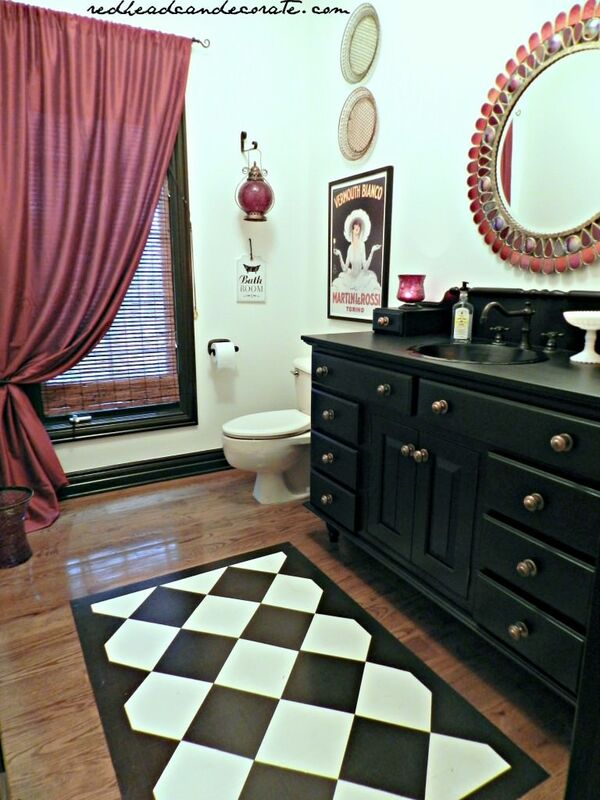 Love the entire powder room and I will be attempting the black vanity in my guest bedroom bath. Love, Love, Love it. 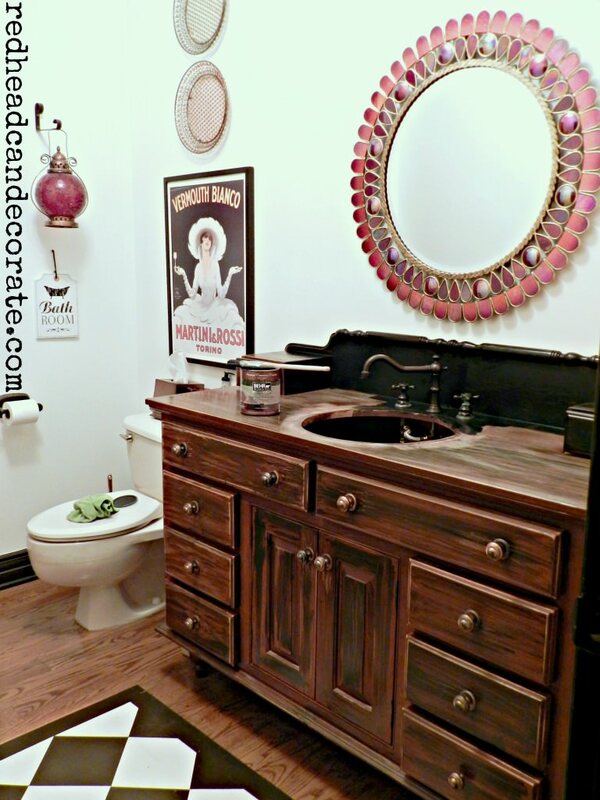 We just replaced the top and sink of our wooden vanity and would like to do the same black paint. My question is: did you remove the doors before painting? Another “Amazing” makeover! I’m partial to black and white so the vanity makeover earned ⭐️⭐️⭐️⭐️! Yeay, 4 stars!!! Thanks, Darlene! I would be interested to know how you painted your sink. You do fabulous work and I’m always accessing your site to show people what you have done.